Go out of this world with your next team building activity! The Corporate Mission Program will take the participants on a simulated space mission to Mars. The story line is one crew has already begun researching and living on Mars at the Chryse Weather Station, the second crew is traveling the Serenity Spacecraft to relieve the crew, repair and launch and aging weather satellite, and continue Martian research. Along the way, the teams will be faced with mechanical issues with the spacecraft, troublesome weather on Mars and the perils of space exploration. Each team will work collaboratively with the other members aboard the space craft or in Mars Control and collaboratively as a whole team, both Mars Control and Spacecraft, to accomplish the mission. Teams are the Navigation, Medical, Probe, Remote, Life Support, Isolation, Communication and Data teams. Navigation is responsible for charting the course to the Red Planet and ensuring the safety of the crew. Medical is tasked with the safety, health and well being of each astronaut. Probe is responsible for rebuilding, repairing and launching the aging weather satellite. Remote has the job of examining the Martian soils and rocks for signs of life. Life Support has the critical task of monitoring the life support systems aboard the Spacecraft. Isolation will be working with robotic arms in containment units to secure and stabilize any hazardous substances. Data is an important link connecting the Spacecraft and Mars Control through written communication, while Communication is responsible for oral communication between the two teams. The entire mission team will need to collaborate throughout the mission to find alternative ways to successfully reach Mars and avoid any troubles along the way. Along the way you will be guided by the Challenger Learning Center Mission Commander and Mars Commander. We can tailor the mission to meet any specific team building needs that you may have. The day will begin with an Engineering/Rocket Design Challenge workshop, where teams of five participants compete by designing, building and launching the best project. 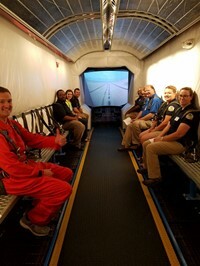 After lunch, team members partake in a simulated mission to the Moon or Mars where teamwork, communication and problem-solving are essential for a successful mission. Cost: $2,200/group includes catered boxed lunch. Call us at 419-725-5926 or email at challengerlc@esclakeeriewest.org to schedule your corporate team building mission today!